Cashback Monitor Bookmarklet enables you quickly jump to Cashback Monitor page from the store you are visiting, so you can view all the reward information for that store with one single click. For Chrome, Firefox, and Safari on desktop: Drag and drop the above link onto the browser's bookmark toolbar. If the browser's bookmark toolbar is not showing, change the browser's setting to have the bookmark toolbar shown. 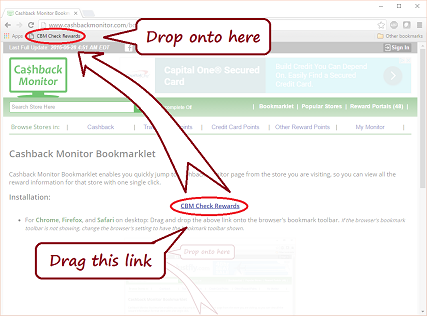 While visiting a store's webpage, clicking Cashback Monitor Bookmarklet on your browser will take you to Cashback Monitor page with reward information about the store. 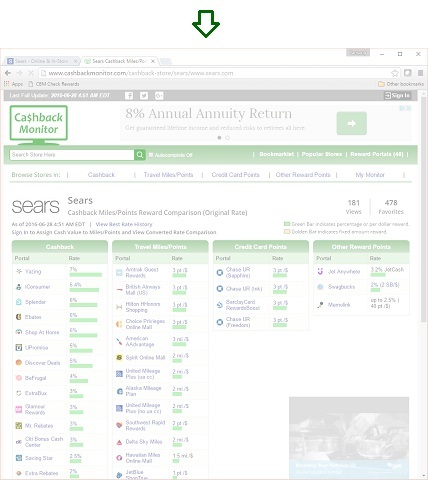 When there is only ONE Store matching the URL, the Cashback Monitor Store Page is displayed immediately. Sometimes, there are more than one store matching the URL. Then, all matching stores are listed. Click a Store to visit the Cashback Monitor Store Page.